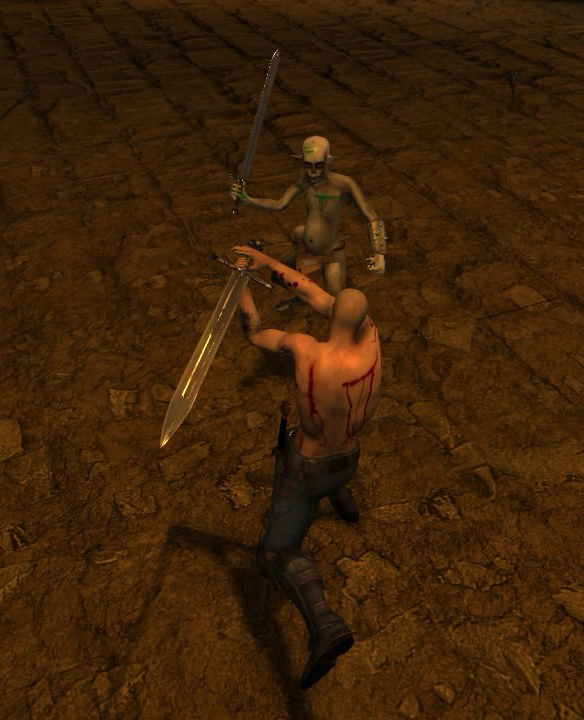 In this update I show the implementation of Two-Handed Swords in addition to AI, combat and graphical improvements. Two-Handed Swords are extremely slow and consume a lot of stamina, on the other hand they deal great damage with high limb slicing chance and cannot be disarmed, in addition they have a disabling impact on the enemy, meaning whenever a character takes a Two-handed sword hit it will be disabled for a short period of time. Blocking Two-handed sword attack with a weapon has additional stamina cost, this gives Two-handed swords a great disarming ability as the disarming occurs when blocking an attack with a weapon while the stamina is lower than a specific threshold AND the attacker’s stamina at the same time. Obviously a shield cannot be used along with Two-Handed Swords, but with the right timing Two-Handed Swords can efficiently be used to block enemies attacks. however, this become more difficult when engaging with more than one enemy. Health magic spell: can only be casted on enemies that are in disabled state. Disarming feature: disarming occurs when blocking an attack with a weapon while the stamina is lower than a specific threshold AND the attacker stamina at the same time. animated bleeding wounds on character’s body, the wounds are aligned with the direction of the received hit. implementing disarming feature for AI. AI can use any weapon of any type. when disarmed AI will pick up the closest weapon of any type. more flexible and adjustable AI behavior. improved collision detection prevents AI from occasional overlapping with other objects. That was all for this update, hope you like it and stay tuned.